It isn't easy to take a car to Block Island, but you won't really need a car to enjoy your island escape, especially if you visit during the busy summer tourism season. Beaches, shops, restaurants and several inns and hotels are all located within walking distance of the Old Harbor ferry terminal, the point of arrival for Block Island-bound ferries. Taxis are readily available if you're staying elsewhere on Block Island or if you'd like to explore more of the island's sights including Clay Head Preserve: one of the best beaches in Rhode Island. Mopeds and bicycles can also be rented near the ferry dock. There is also one rental car outfit on Block Island: Contact Block Island Bike and Car Rental Inc. to reserve a vehicle. If you decide, however, that you will absolutely need to have your own car with you on Block Island, you have only one option for transporting your vehicle: the Block Island Ferry, which operates year-round from Point Judith in Galilee, Rhode Island. Cars are transported only on the traditional ferry: not on the Block Island Hi-Speed Ferry that operates from the same location. That is the Block Island car ferry (or traditional ferry) with the rectangular windows hiding behind the Block Island Hi-Speed Ferry in the photo above. Both depart from Point Judith, Rhode Island. Taking a car to Block Island requires advance planning, especially for summer visits. Vehicle reservations for summer weekends and holidays should be booked four to five months in advance, and all reservations must be pre-paid with a credit card. For reservations, call toll free, 866-783-7996, ext. 3. Taking your car to Block Island will not be cheap. As of 2019, the one-way rate for a standard size vehicle is $39.60, and round-trip cost is $79.20. Higher rates apply for SUVs, pickup trucks and other larger vehicles. 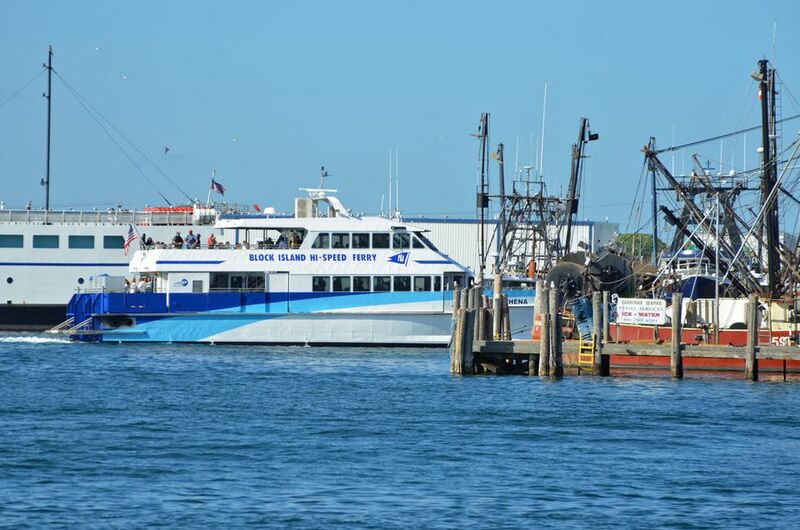 The traditional ferry makes the trip between Point Judith and Block Island in about 55 minutes. Try to make your vehicle reservation in early January if you plan to spend one or more summer weekends on Block Island. You will forfeit your reservation if you do not arrive at the Point Judith ferry dock and check in at least one hour before your scheduled departure. Plan to arrive extra early. Galilee is an authentic fishing village, where you can spend time watching boats at work or dining on fresh seafood at restaurants like Champlin's or George's of Galilee: Both are a short walk from the ferry terminal. You will need to show your reservation confirmation letter and photo ID to take your car aboard the ferry. A $12.85 fee per one-way fare ($25.70 round-trip) applies to reservations canceled seven or more days in advance of departure. There are no refunds for reservations canceled less than a week before departure. Reservations can be changed twice prior to the week before departure; they may be changed only once if changed within the seven-day period prior to departure. Missed your reservation date and time? Your reservation can not be changed. A standby option is available on the day of departure for travelers who would like to transport their vehicles to Block Island. It requires waiting with your car until a ferry spot becomes available, and a return reservation is not guaranteed, which could leave you in a bind when it comes time to return from Block Island. Limiting the number of vehicles that can be brought onto the island is one way that the pristine nature and unique character of Block Island is preserved, so while you may find the cost and complexities of bringing a car to the island a hassle, there's a reason car traffic isn't encouraged. Block Island is home to rare and endangered species of plants and animals and has long been a priority for conservationists. If at all possible, you're best off leaving your car on the mainland, especially if you're visiting Block Island for less than a week during the height of the summer season. If you do decide to bring your personal vehicle to Block Island and you experience problems during your stay, contact Murphy's Auto (401-466-5492) or Peter Mott Auto Repair (401-466-5139) for assistance.